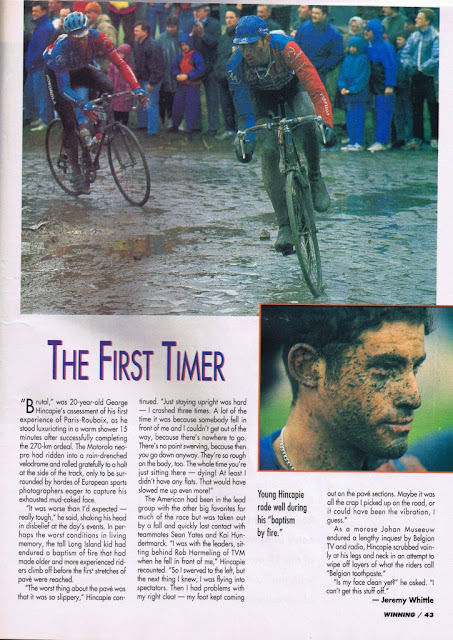 This'll be George Hincapie's 14th try at Paris-Roubaix, I believe. He's come close to winning, finishing 2nd in 2005, with a handful of other top ten finishes. He's got the experience, but it seems to take a liberal dose of luck to succeed. Here's a little one pager from 1994 about him, from the June issue of Winning magazine. I wonder what 20 year old George Hincapie would have said had they asked him whether he would be racing Paris-Roubaix 16 years later - let alone whether he'd be considered a contender. "Morose Museeuw"! Love it! Thanks!